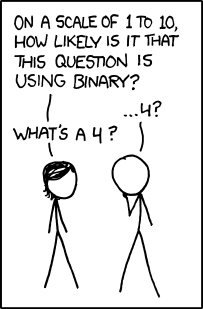 Binary is the type of numbering system that is native to computers. It is base-2. Numbers that normal people work with are called decimal or base-10. We’ll stop here since we have now counted up to “10” in decimal. Another way you can parse this number is to think of how each position represents a component of the number. Adding 8 + 2 gets you to 10 decimal. Which sums to 255, a number I’m sure you’ve seen around before. It is the maximum value you get with the UInt8 data type in Xojo. Conversely, you can convert a decimal number to binary by repeatedly dividing it by 2 and noting the remainder. When the remainder is even you write a 0, when it is odd you write a 1. And then you read the number from the bottom up. I hope you now consider yourself part of the group that understands binary!